There’s a market phenomenon that has a long track record of predicting recessions. It’s called a “yield curve inversion." Such an event occurs when the yield on short-term bonds, such as 1-year Treasuries, are higher than long-term bonds, such as 10-year Treasuries. Normally the yield on longer-term bonds have to be higher to compensate investors for locking up their cash for longer (the longer the maturity, the more uncertainty and risk the investor faces). So it's highly anamolous when a short-term bond’s yield is higher than a long-term bond's. Curve inversions have “correctly signaled all nine recessions since 1955 and had only one false positive, in the mid-1960s, when an inversion was followed by an economic slowdown but not an official recession”. When the economy is heading to a recession, knowing interest rates are to trend lower, investors are more willing to invest in longer-term securities immediately to lock in current higher yields. This, in turn, increases the demand for longer-term securities, boosting their prices and further lowering their yields. It can be a bit tautological--investors sense a recession, and so behave in a way that signals recession--but the advantage of yield curves is the "wisdom of the crowds" tempered by everyone putting their money where their mouths are. Meanwhile, few investors want to invest in shorter-term securities when presented with lower reinvestment rates. [Emphasis mine] With lower demand for shorter-term securities, their yields actually go up, giving rise to an inverted yield curve when yields on longer-term securities have come down at the same time. If I'm to understand this, the demand (and therefore price) for shorter-term bonds falls... because when those bonds mature, we'll be in that recession and there will be lower reinvestment rates? Even if your bonds mature in the middle of a recession and you find yourself with cash and few good fixed-income options, at least you made some initial yield, no? "There’s been a good bit of evidence that the declines in the term premium and perhaps a great deal of saving chasing a limited number of investment opportunities around the world have led to a somewhat permanent flattening or even inversion of the yield curve, and that pattern does not necessarily predict a slowing in the economy or recession." How hard can we bust balls here? It's easy in retrospect. However, there are lots of people saying that this time is different, too. QE and central bank support of bond markets may have distorted the signal. I don't buy it. Neither do Fed researchers who basically say that an inversion predicts an economic slump, no matter the driver of the inversion. To summarize some historic statistics about yield curve inversions from my notes, it took an average of 10 months between the time that the yield curve inverted and the peak of the stock market, and an average of 5 months between historic market peaks and the start of recessions. If the yield curve inverts by the middle of 2019 (something that Morgan Stanley analysts believe, although I've heard estimates of inversion as early as December 2018), the current bull market would peak in April 2020 and the next U.S. recession would start in September 2020. Timing the market is ill-advised, and this is a highly imperfect estimation. But it’s all but certain that the business cycle will bring another recession. I’d hedge strongly based on the yield curve. Does anyone wanna make a prediction? I place 70% confidence that a 10-year US Treasury compared to the 2-year US Treasury will invert sometime within a month of February 2019, and then within 12 months of that inversion we will see the peak of the bull run, and then 6 months from the peak will be a recession. This is confidence is borne of a complete amateur not even running line-of-best-fit software. By the way, that differential today is .22% from a .88% a year ago, 2.5% five years ago. If the prediction were true, what then? This is helpful in so far as selling assets e.g. a house is easier in a bull market. People feel wealthier with rising asset prices. The Warren Buffet take is (probably) not to time markets but, failing that, not buy when everyone else is buying. That means holding or selling, building up cash for the discounts sure to come in ~2 years from now. Edit to add: It surprised me that this phenomenon was only first documented in 1986 by a Duke economist. I thought such a strong predictor would have been discovered or postulated sooner. That's a lovely animation. Worth the price of admission right there. So here's the thing. Ever heard of Heisenberg's Uncertainty Principle? We don't need to get into the technicalities of it; basically it boils down to the better you know a particle's momentum, the worse you know it's position and vice versa. This is seriously fucked up from a classical mechanics standpoint because what it proves, mathematically, is that "observation" (non-interfering interaction) changes the result. You can not draw a straight line from physics to economics no matter how hard some economists would like to. What you can do is note that it's a vast interdependent system and that interacting with it changes things. The bigger your interaction, the bigger the change. You can also note that fundamentally, economics is a person selling something to another person times every person with money or product and that it can't help but be shaped by sentiment. The yield curve is a function of the ratio of two numbers. One number is the interest rate on a long-term contract. The other number is the interest rate on a short-term contract. Those interest rates reflect the agreed-upon price that lenders and borrowers interact at. Short term contracts reflect agility and uncertainty; long term contracts reflect stability and dependability. CRUCIAL ASPECT: I want to make money with my money, so I have to lend it out. In order for me to get any interest on it, someone has to borrow it so I'm looking to lend. The question is for how much and how long. Let's say rates are at 4%. If I'm willing to lock my rates for ten years at 4% I think that rates aren't going to be hella higher for the next ten years. If I think they're going to climb to 5% or 6% I'd rather have stuff in short-term because then I can re-sell my money to make more money in three years. But if I think they're going to fall to 3% I wanna lock up as much as I can at 4%. And remember, compounding is king: $100 for 10 years at 4% is $148 but $100 for 15 years at 3% is $155. 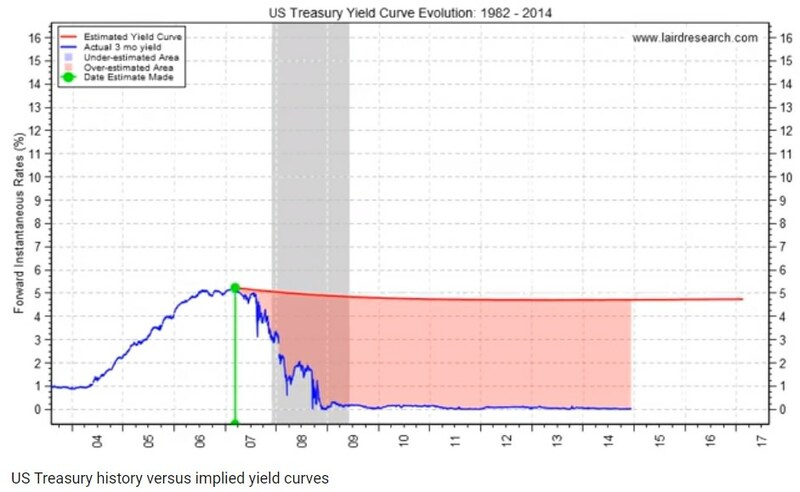 What you're seeing when the curve inverts is a consensus projection that rates are going to fall. A consensus that rates are going to fall is a consensus, fundamentally, that the central banks are going to lower interest rates. A consensus that the central banks are going to lower interest rates is a prediction that the economy is going to need interference in order to function properly. It's fair to say that an observation of the yield curve is an observation of sentiment. Sentiment, really, is what makes markets - the desire to play the ponies. Pointing at Bernanke is legit - he makes much in his book about how everything he says is parsed and reparsed for trade signals which is a tacit admission that the world's economy is dependent on what a bunch of dudes want it to be. Even if your bonds mature in the middle of a recession and you find yourself with cash and few good fixed-income options, at least you made some initial yield, no? Yes, you're ahead after Year 1 having bought the short-term bond with a higher rate, but now you have to find something to do with your cash for the next nine years, while your alter ego has the reliable income of the ten-year bond. You got more income but less predictability. If your options are poor after one year, you might end up behind over the decade. I don't understand why the animation plots the yield curve over time against the actual 3-month yield. This is an animation showing the 3 month US treasury yield (blue line) versus the implied forward yield curve (red). The forward yield is estimated looking at the yields on 3, 6, 9 mo and 1, 2, 3, 5, 7 and 10 year government bonds. The blue highlighted area shows where the yield curve underestimated actual results and the ping highlighted area shows overestimations. The red line is the yield curve from March 2007, pretty closely matching the official numbers from that month, so I don't see why it's "estimated" or "implied." The gap between the 5-year rate in March 2007 (about 4.5%) is vertically contrasted with the March 2012 3-month rate (about 0.1%) and the "over-estimated area" between colored red. What is that supposed to represent? Five-year rates are not predictions of what three-month rates will be in five years. I place 70% confidence that a 10-year US Treasury compared to the 2-year US Treasury will invert sometime within a month of February 2019, and then within 12 months of that inversion we will see the peak of the bull run, and then 6 months from the peak will be a recession.... By the way, that differential today is .22%. I love a prediction. Can we stipulate treasury.gov as an authorative source? They show rates of 2.92% for a two-year and 3.20% for a ten year T-bill, a gap of 0.28%. I don't know who calls the peak of a bull run, but NBER seems to have say-so over recession dating. +1 for short-term bond demand-decrease explanation. I think the animated yield curve is "estimated" or "implied" because of the interpolated yields along the line (there isn't a bond between 3 and 6 months, but the line implies there is one). I, too, don't understand the purpose of the pink and blue shaded regions. I'm trying to wrack my brain because the animator issues economic advisory reports for a team of researchers so there must be a reason, right? I'm wondering if reaching out would be worthwhile, if 2014 is too long ago to remember, or if the animation was outsourced. Yes, I love a prediction, too. My prediction: inversion of 10-year rates and 2-year rates + or - one month of February 2018, with a peak of the stock market (as measured by Google ticker for S&P 500? I'm open to suggestion) 12 months after with a one month margin of error (so if an inversion occurs in January 2019, a stock market maxima has to occur within December 2019 - February 2020) with an NBER-marked recession within 6 months hence. I'm tempted to say that a stock market peak has to occur within the following year, rather than within a narrow 3-month band, but the data is pretty strong that the post-inversion stock market peaks occur a healthy amount of time after, so the prediction will stay as such. I see; the yield curve chart is a smooth estimate of the rates you could imagine getting if terms were offered between the official periods like 6 months, 1, 5, or 10 years. Per Mr. Laird, the animation is intended to show that today's rates are poor estimators for future rates. I can't imagine why anyone would think they are good estimators. It seems to me that today's 3-month rate is a better guess for the October 2023 3-month rate than today's 5-year rate, if you had to guess. • The 2-year T-bill rate is higher than the 10-year T-bill rate on any day from 1 January 2019 to 31 March 2019. • If such an inversion occurs, then the S&P 500 Index as reported by Google will have a higher value on at least one of the 365 days before the inversion date, or during days 395 to 760 after the inversion first occurs, than it does at its highest value in the 394 days following the inversion. • If such an inversion occurs, NBER will add a new business cycle to its list of business cycle reference dates with a "peak" date during the six months following the S&P 500 maximum described above. My confidence level is 90%, not because I know what I am talking about, but because of the conjunction law. When would be a good check-in date to resolve this? The conceivably-latest point at which my prediction would still hold would be August 2020 (if NBER states a recession started at least as late as February 2020). The U.S. Yield Curve Just Inverted. Super interesting. This bit of news came out in time to make it into my presentation on monetary policy, the main thrust of which is that quantitative easing and interest payments on those newly created reserves will become conventional monetary policy. Long story short (ok it's still long), QE was a method of bringing down long-term interest rates when nominal short-term rates were already near zero. Saved the economy? The Fed certainly thinks so, and the argument is coherent (bring down cost of borrowing, spur investment, recover, etc.). So all the trillions of dollars in bonds and mortgage-backed securities banks were holding the Fed purchased with (digitally summoned from thin air) money. But trillions of dollars entering circulation would lead to hyperinflation, so the Fed incentivized banks not to lend this new money out. How did they do that? Simple: They killed the Batman, er, the Fed started paying banks interest on their reserves. The rate was quite low: .25% between 2008 and 2016. But .25% interest on an amount that fluctuates between $1 and $2 trillion is still quite a lot. By my math, interest payments to banks grew gradually from $2 billion to $11 billion by 2016. Then $25 billion in 2017. It'll hit something like $50 billion by the end of 2019. I'm tempted to expand the tangential point that these interest payments are a de facto subsidy of the banking industry. That of the 6,800 banks in the US, the top 25 institutions get half these payments. That a third of interest payments on reserves go to foreign own institutions. But I'm not an economist (yet). Controlling inflation is an obvious function of paying IOR (interest on reserves). But the Fed still has to achieve its monetary goals and promote "maximum employment." And its conventional instrument--targeting a federal funds rate by manipulating the supply of reserves through open market operations--requires a scarcity of excess reserves. Now they're not so scarce. But there's another important benchmark interest rate that the Fed can set: the rate of interest it pays on reserves. Raise that rate and banks will park more of their money in reserve, restricting the money supply, and discourage lending, or lower it and get the opposite effects. My conclusion was that this may be the new, "conventional" policy instrument. Even though the Fed started "normalizing" its balance sheet in September 2017 by selling more of its bond holdings, this process will almost certainly not finish before the next recession. And if it's a particularly bad recession, with nominal rates (i.e. IOR-rate) pretty low at 2.25%, there's not a lot of room to wiggle room. I can't imagine the Fed standing by idly, and so may well do more QE and, for the reasons explained above, continue to pay interest on reserves. This yield curve inversion bolstered my point that a recession is a-comin'. It seems to be dying. There are too many ways to interpret this statement without more context. What's dying? The 3 mo yield. Each high and low is lower than the previous. I wouldn't know where to begin assessing the reasons why. A global decline in worthy borrowers compared to itchy savers? Monetary policy? Something something moons of Vega?